I spotted this book on a friend’s bookshelf and was intrigued. It looked like the type of scifi book I read as a teen. 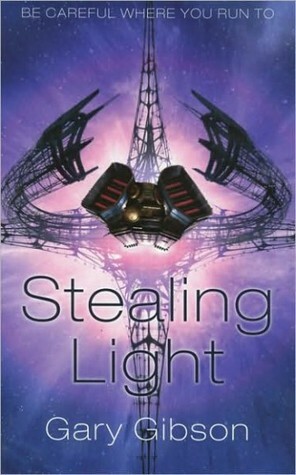 Stealing Light is a fabulous, wide-ranging hard scifi with massive concepts – just how I love my scifi, truth be told. This is a book of intergalactic proportions – and implications. Humanity is far from dominant in this tale. The galaxy is strictly controlled by the Shoal Hegemony – the Shoal being, well, fish, and fish who are on the run – and the various species inhabiting the galaxy may only live where the Shoal say they may. Privileges that can be revoked at any time, without explanation. I loved how Gibson weaves together several storylines – two following one main character (two different times), another following the other, and yet another following one of the Shoal members – building them up to the final climax of the book – and the shocking aftermath. This is a tightly woven story and I didn’t detect any loose threads as the book came to a close. All the hints were there, the developments, the threats. This book is an excellent study on the concept that with great power comes great responsibility. Be careful who you give power to!